Lt. Col. (Res.) Uri Ben Yaakov is as the Director of Development and a Senior Researcher at The International Institute for Counter-Terrorism (ICT). In addition, he serves as a lecturer at the Lauder School of Government, Diplomacy & Strategy in the field of Open Source Intelligence, Simulations and Laws and Terrorism. He brings to ICT a wide experience in intelligence, analysis, research and management. Lt. Col. (Res.) Ben Yaakov began his military service in the Paratroopers in the Israel Defenses Forces (IDF) and continued his service in various intelligence positions. He has a BA in General Studies from Tel-Aviv University and later on completed his law studies. He finished his MA studies in Government with Specialization in Counter-Terrorism & Homeland Security and a Certificate in Cyber-Terrorism from the Lauder School of Government, Diplomacy & Strategy at the Interdisciplinary Center (IDC) Herzliya. Lt. Col. (Res.) Ben Yaakov is an accomplished businessman with international experience in Europe, Israel and Asia. 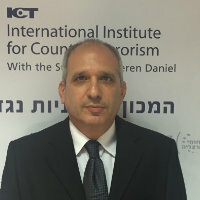 He is the representative of ICT to the Israeli Parliament for the proposed Counter-Terrorism Bill and a specialist in the field of Syria, Cyber-Terrorism, Terrorism Financing and International Cooperation.